Wing wizard Rilwan Hassan was on target as FC Midtjylland lost 5-2 to SoenderjyskE at Sydbank Park on Friday afternoon in a Danish Superliga encounter. With the home team leading 2-0, the FC Ebedei product reduced the deficit when he volleyed the ball into the back of the net in the 45th minute. Hassan is having one of his most productive seasons since his promotion to the first team of FCM seven years ago. His strike against SoenderjyskE means he has now contributed to 15 goals (4 goals, 11 assists) in 41 appearances in all competitions this season. 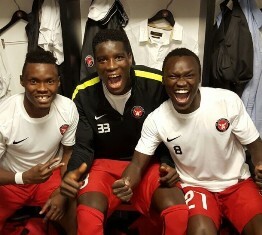 Rilwan Hassan and Dream Team VI striker Paul Onuachu logged ninety minutes each for FC Midtjylland.